The DEP’s last minute letter amounts to an arrogant U-Turn in prior support of the bill. There is no other way to put it: DEP has sandbagged Smith and McKeon. The sponsors of the bill, Senator Smith and Assemblyman McKeon, have assured the public numerous times that the FSC standards and certification process in the bill would provide effective safeguards to protect our forests, and assure that any commercial logging is done in a sustainable fashion that is protective of the environment. The DEP’s flat out opposition to FSC certification is a dramatic U-Turn on the proposed legislation, which DEP has supported for a long time. The DEP’s clear rejection and refusal to abide by FSC standards and certification completely destroys the logic of the bill and pulls the rug out from under the sponsors. This could be a face saving measure for Smith and McKeon to abandon the flawed “forest stewardship” legislation, which is scheduled for final legislative approval by the Assembly on Monday. See the DEP letter and my letter to Smith and McKeon below. I just received and reviewed the DEP letter of June 10, 2013 to Chairman Albano regarding your bill (attached). I am very concerned about the implications of this letter with respect to any implementation of the current version of your bill, should it be approved by the Assembly and the Governor signs it into law. You both have relied upon – and given the public numerous assurances – that the Forest Stewardship Council (FSC) standards, certification process, and audit provisions of your bill will provide safeguards to assure that our forests are not commercially logged to maximize timber values and DEP revenues, but instead managed by sustainable and stewardship principles. Reversing prior DEP support, the DEP has now flat out rejected rejected the FSC or the need for the FSC in DEP’s forest management program. 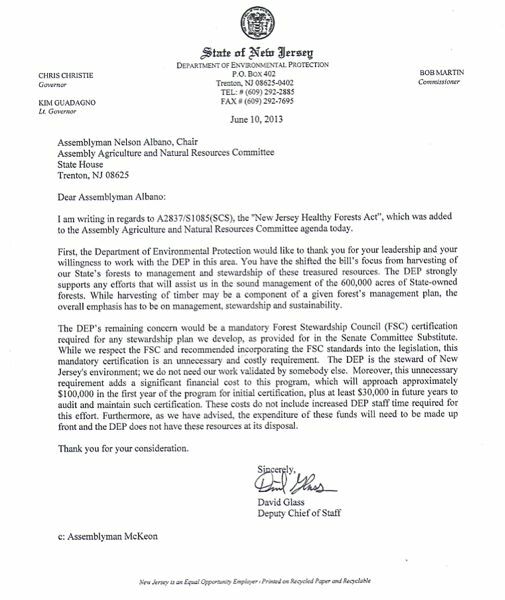 Clearly, DEP will not implement or abide by any FSC certification reviews, recommendations, or audits. That means the FSC process is fatally flawed and can not provide any safeguards. As the bill does not mandate that DEP promulgate FSC standards as regulations, the FSC standards – in addition to being resisted and ignored by DEP – will have no legal enforceability by the public or impacted stakeholders. In light of this new development, I strongly urge that you both abandon the current version of your bill as unworkable and stop the proposed Assembly vote on Monday, the final legislative step in the bill’s review by the Legislature.